Comprehensive information about Rabindranath Tagore including biographical information, facts, literary works, and more. Rabindranath Tagore was a Bengali poet, philosopher, visual artist, playwright, composer, and novelist from India. He won the 1913 Nobel Prize in Literature. This educational Rabindranath Tagore resource has information about the author's life, works, quotations, articles and essays, and more. 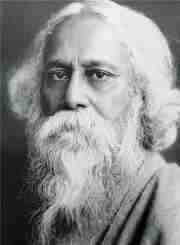 Articles about Rabindranath Tagore or articles that mention Rabindranath Tagore. Here are a few random quotes by Rabindranath Tagore. In the mountain, stillness surges up to explore its own height In the lake, movement stands still to contemplate its own depth.